Forge's young vines came from the Hermann J. Wiemer nursery. Based on the street cred earned at his Château de St.-Cosme estate in Gigondas, vigneron Louis Barruol could have easily picked a more prominent spot to extend his efforts. But he chose the very non-Rhône climate of New York's Finger Lakes, and the very non-Rhône grapes Riesling and Pinot Noir, to try his hand at something new. "I always wanted to create a vineyard from zero," says Barruol of his decision. "I wanted to grow grapes I like in their northern climate limit, in a great soil, giving a clear identity with an idea of origin. I wanted to make wine that could age. It had to be a place where the land was not too expensive. I love Riesling and Pinot. The combination of all of that worked very well in the Lakes." Barruol connected with Rick Rainey (who works on the import side of the wine business) and Justin Boyette of Hector Wine Company. Together the trio debuted their Forge Cellars with 700 cases of wine in the 2011 vintage. They've been humming along ever since, growing to 4,500 cases in 2015. The ultimate target is 10,000 cases. The wines are currently made in space leased from Boyette's Hector Wine Company, though a new facility specifically for Forge is under construction on the slope above Route 414 in Hector, N.Y., with plans to be finished in time for the 2016 harvest. It will be primarily solar powered, with propane-powered forklifts and high-efficiency heating and cooling. "We're just trying to build a winery that other wineries could use as a template for a high-efficiency building that is realistic to build in terms of cost per square foot. And also trying to limit the usage of fossil fuels where we can while being realistic," says Rainey. Barruol has brought a heavy dose of vinification techniques that are still relatively unused in the Finger lakes—using oak for vinifying and aging, as well as whole clusters, for the Riesling as well as the Pinot Noir. So far, the Riesling has established itself as a new benchmark for the region, and the Pinot is improving quickly. "We need the texture and density the oak adds because we want the wine bone-dry," says Rainey, referring to the Riesling in particular. "If we used only stainless-steel tanks, the wine would be too angular." The lineup is expanding quickly too, with a focus on single-vineyard bottlings, many of which will only total 50 to 100 cases or so per release. These are chosen after vinifying, based on quality and distinctiveness. The top wine, Les Alliés (the allies), is a blend of the best lots. The Classique bottling, made from a blend of the remaining lots, forms the bottom of the production pyramid. Tasting with Rainey in the Hector Wine Company facility amid a hodgepodge of barrels and tanks, we worked our way through numerous vineyard lots of 2015 Rieslings, including a Sunrise Vineyard lot that showed intense mustard powder and lemon pith notes and a Leidenfrost vineyard lot that was perfectly pitched with bright floral and yellow apple notes. Two separate lots from the Sawmill Creek Vineyard showed how distinct even parcels within a single vineyard can be—the upper block had taut chamomile and talc notes while the lower block showed ripe lemon curd and yellow apple flavors. In sourcing their fruit, Barruol and Rainey pay by the acre and then direct the viticulture themselves, a quality-first approach that is a sharp break from the quantity-first approach employed by many. 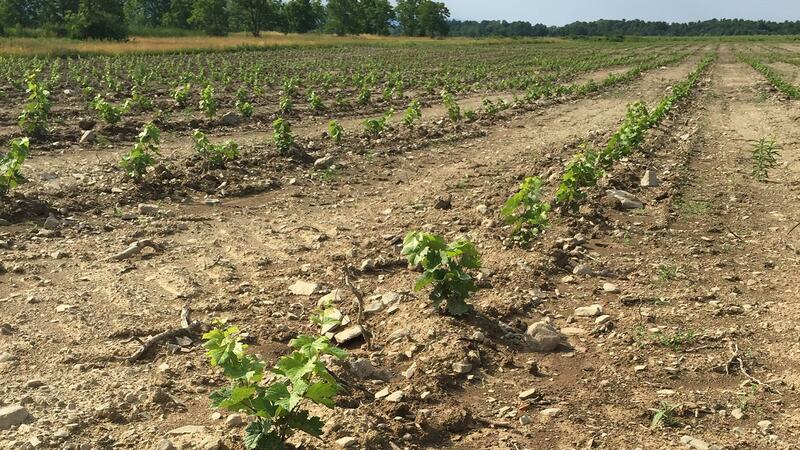 The Forge team has also planted their own vineyard, just below the new winery site. The 3-acre plot is two-thirds Pinot, the rest Riesling, all at an atypically (for the Finger Lakes) density of 2,100 vines per acre. The material for the new plantings came from the Hermann J. Wiemer nursery. The approach at Forge isn't new—it's been tested often enough by Barruol back home in France. But it is new to the Finger Lakes. The results are dramatic enough that the rest of the region—and you the consumer—should pay close attention. Great Rieslings, but I feel the Pinot still comes across as a bit heavy handed with the stems and oak not in complete harmony with the wine, at least in past vintages. Improving but still a ways to go with the Pinot IMO. Excited to go back and try the different single vineyard Rieslings, between the top 6-8 producers the FLX have come a long way with this grape and are making world class wines.